Painting/spraying your plastic car parts is a great way to improve the appearance of your car and make it personal to you. This guide will take you through the steps required to get a professional looking and long-lasting finish using cheap(ish) rattle cans. I've based this guide on spraying bump strips but the same exact same method can be applied to any car plastics e.g. interior trim, wing mirror caps. The most important thing needed to get a good end result when spraying is patience and time. If you have those two things and follow this guide you will end up with a great looking finish. A warm, dry, dust-free area to spray in. A range of sandpapers from 150 - 2500 grit. 2500 grit will be what is known as wet & dry e.g. You can/should use it with water for lubrication. A cutting compound such as Meguiers Scratch-X, any off the shelf scratch remover will also be fine. 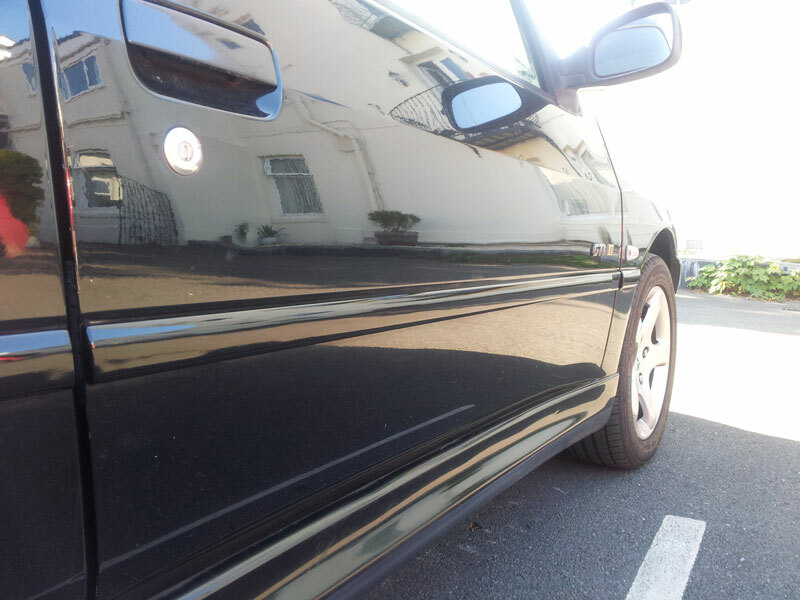 Paint polish such as Autoglym Super Resin Polish. As a guide to how much paint you will need, colour coding the bump strips on my car used two cans of plastic primer, two cans of colour and one can of clear lacquer. All cans were 300ml. The first thing to do is obviously remove the part/s you wish to paint, be careful not to scratch them as this will mean more work for yourself. 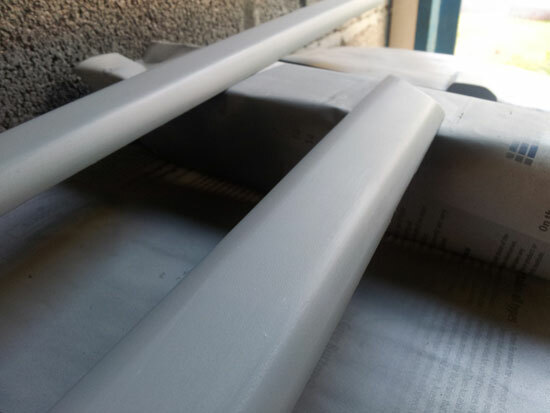 Before you can start with the primer it is vital to key the surface of the car part and remove any 'bobbles' which are common on many exterior plastic parts. The bump strips I am colour coding had these bobbles on and from experience I have learned how important it is to completely smooth them out using sandpaper. I started with 150grit, then 800grit and finally finished off with some 1200 grit to get a smooth finish ready for priming. This a bit of a rubbish job as sandpaper doesn't seem to work too well on plastics and tends to get gunked up quite quickly meaning you go through quite a few sheets. I cannot stress enough how important it is to take your time on this and get a nice smooth surface. For parts which don't have bobbles on it is still important to key the surface and remove the shine, if you don't do this the primer cannot take properly and 3 months down the line the paint will probably start to flake off. Once everything is nice and smooth give it a really good clean with some warm soapy water and then rinse with cold water. This is important to completely degrease the surface and get rid of any grim which has built up over the years (especially if it is an external part). Soaps have all sorts of chemicals in which you don't really want to leave on the part in case they react with the paint. Better to be safe and just rinse it all off. Leave the part to dry somewhere it won't get dusty and have a cup of tea safe in the knowledge that stage one is complete. Clean - There's nothing worse than finding a some bits of dirt/fluff/dust have landed in your paint whilst you are in the middle of putting a layer on. Warm, dry, low humidity - All of these things are essential conditions for the paint to dry quickly and properly. Indoors - I guess you could spray outside if you really needed to but I imagine you would use double as much paint and the chances of some sort of insect/cat/grass messing up your meticulous painting is increased. As you are spraying onto plastic make sure you have special plastic primer and not normal primer. Read the instructions on the can. Shake it hard for a minute until you can hear the ball rattle and make sure the can is at room temperature. Apparently if the can is cold it reduces the pressure which means the paint doesn't spray in as fine a mist. Hold the nozzle about 6 inches away from the part. Smoothly move the can across the face of the part always keeping the can upright. Begin spraying before you move over the part and continue to spray until you have passed it completely. Try to imagine your arm is a spraying robot from a mass production assembly line. Smooth. It will take a bit of time to find the right speed which gives the best results. It's a balance between the layer of paint being too thin (wasting paint and taking ages) and being too thick (risking getting paint runs). Remember, just take your time. TIP: Watch out for the very edges of the part as it can be easy to go too thin on these especially if the part is laid flat on the table and not hung up. No matter how well you prepared the surface and how even your spraying was, the primer will have taken on a semi-rough texture. I don't know why, must be something to do with how the paint molecules settle and dry. We need to remove this roughness by wet sanding. Move your fingers over the area you have just wet sanded, it should feel completely smooth. Now do the same thing over a bit you haven't touched yet, feel the difference? When the part is wet it is almost impossible to tell which bits have been smoothed and which bits haven't by looking so I just tend to do it by touch. You should find the water running off the part is grey colour (or whatever colour your primer is) this is nothing to worry about. If there are any runs in the primer now is the time to gently correct them by spending a bit of extra time sanding over that particular area to get it nice and flat. Using a sanding block or similar flat surface is advisable. Once everything is lovely and smooth give the car part a decent rinse with some cold water to remove any primery water. If you don't do this it will dry into a dust which you will have to wipe off before doing the colour coat. You should now have an erotically smooth primer base ready for the colour coat. Use the same spraying technique as described above, taking extra care to give good coverage to any awkward edges. You'll be rather annoyed if you go to smooth out the colour coat and some grey primer rears its ugly head because the paint was so thin. Four/five decent coats of colour should be sufficient with 20 mins drying time in between. Once this is done leave to dry for approximately three days. You can speed the process up by putting the part on top of a radiator on a low heat. Again I went by the smell test to know when the paint was sufficiently cured to wet sand. By now a lot of people myself included are probably getting a bit bored of all this waiting around and felt a great urge to cut some corners. Resist the temptation, you've put too much time in now to mess things up for the sake of a few hours. If everything has gone to plan you should have a pretty decent looking finish already, any reflections will probably be a bit fuzzy but there is plenty of time left to correct that. The next part of the guide is specific to solid colours i.e. not metallic/pearlescent. Follow exactly the same process as we did when smoothing the primer. A light amount of pressure is all that is required. 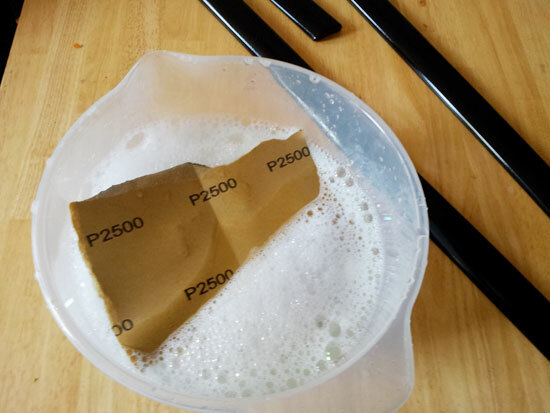 Again it is important to rinse the soapy water off to avoid any potential reactions with the clear lacquer. After you have wet sanded the colour coat you will notice it now has a dull matte appearance once dry and may be thinking something a long the lines of "Oh s*#t I've ruined it". Do not fear this is meant to happen. Almost there comrades. Use the same spraying technique again but bare in mind that lacquer generally seems to be heavier than primer and colours so be extra careful to avoid runs. 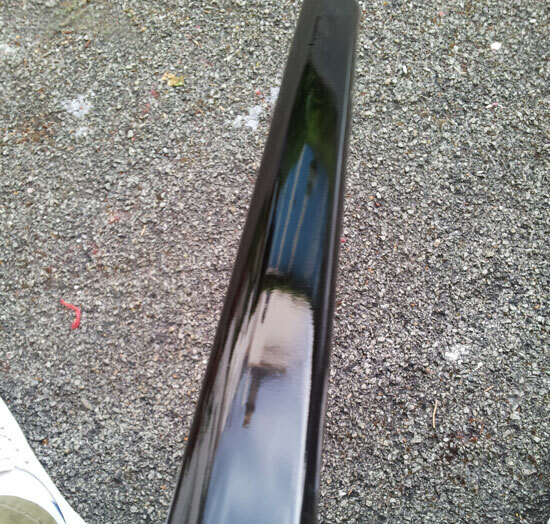 As you apply the lacquer you should see the dull finish spring back to life and take on a lovely deep gloss appearance. How many coats of lacquer should I apply? Three or four decent coats will be sufficient. Wait 20 - 30 minutes in between each coat. Again take extra care to get good coverage on the edges. Leave the car parts somewhere warm and dry for about a week. Applying polish to the lacquer before it has fully cured can spell disaster. I waited a week for my bump strips to fully dry but depending on the size of the part and the temperature this may take longer. To tell if the lacquer is ready give it a smell to see if the solvents are still evaporating. Even when you can't smell anything i'd personally still give it another day or two just to be on the safe side. Most rattle cans have instructions on the side specifically warning against using any polish or compound until the lacquer has completely cured. This is the final stage where you smooth out the lacquer and correct any nasty looking orange peel. If everything has gone well you should have a decent enough looking finish already but with a bit of a cut and polish this can be improved dramatically. It is up to you what type of cutting compound to use. I have used Meguiars Scratch X which is relatively mild with good results but some people might prefer to use something harsher such as G3. Apply a small blob of cutting compound to the center of the polishing pad and start rubbing! Apply a medium to hard pressure and focus on small areas at a time, working the compound in and breaking it down. You should find the optical quality of reflections has been improved dramatically from the cutting process, the last stage would be to use a polish such as Autoglym Super Resin Polish to give that final mirror finish. I made a mistake with these bump strips by not doing a proper job of sanding out the plastic when I first started. You can see in the above photo that although the finish is quite good it still looks uneven. This is the surface of the plastic coming through all the layers. When doing the other side I spent more time sanding out the imperfections and the results are much better. Now stand back and admire your work. :-) I hope you found this guide to painting plastic car parts useful, if anyone has any comments please feel free to add them below. Don't forget the share buttons as well! At the stage where you wet sand the colour coat before lacquering, what do you do if you are using metallic paint? Not sand and go straight to clear coat? Will the finish be rougher? I believe the best way to do metallic colours is to wet sand, then wipe clean and wait to dry, then do one last coat of colour and wait for it to flash dry (approx 5 minutes) and then apply the first coat of lacquer. You can wet sand and then go straight to lacquer and it will look good but I think adding an extra coat of metallic will give a better finish. If you don't wet sand at all and go straight to lacquer it will probably result in quite bad orange peel unless you have done a Very good job on the colour coats. You need to leave metallics for an hour after final top coat. Afterwards wet sand with 2500 extremely gently with a flowing water supply i.e hose, right where your sanding. Dry & laquer. 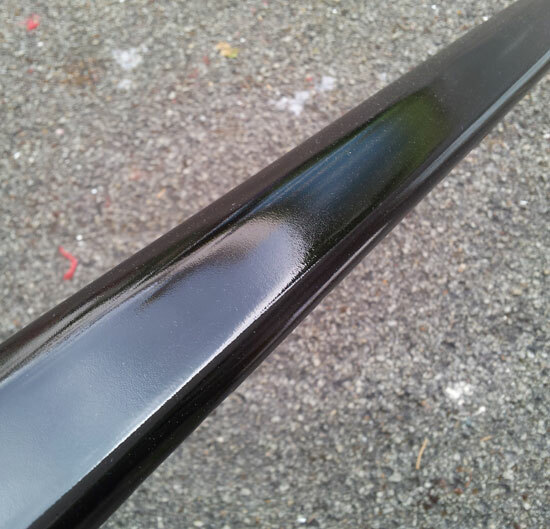 I mix in a little colour to my laquer (using compressor & spray gun), if you dont have the tools, just laquer from a can will provide a decent finish if applied correctly. Cheers, Pete. Maybe a stupid question, but I'm planning to paint the mirrors on my truck using this method, but since it's the only vehicle I have, I would likely be driving in between coats. I've sanded the plastic down smooth now, but I'm wondering if it would be disastrous to drive with just the primer on, or especially between the lacquer and the cutting. Any thoughts? Should I wait until I have a full week where I won't need to drive to take on this project, or will I just need to be extra careful when I'm sanding? You could drive between coats as long as you thoroughly clean any dust/flies/road grease from the mirrors before continuing with the next coat. Imo it would be better to do it all in one go as you could easily get a stone chip or something and then you'd have to start all over again. Good article! Very useful! Just wondering, does the lacquer spray last more than a couple of days after first being used (i.e. for other jobs maybe weeks or months later)? The reason I'm asking is that I'm only painting a very small plastic item for the car (parking sensor). Thanks! Hi! I'm not sure if paints have best before dates on them, I would say as long as you give it a really good shake before next using it (5 mins of rigorous shaking should do it) you should be ok. If not I imagine the different parts of the paint will separate. 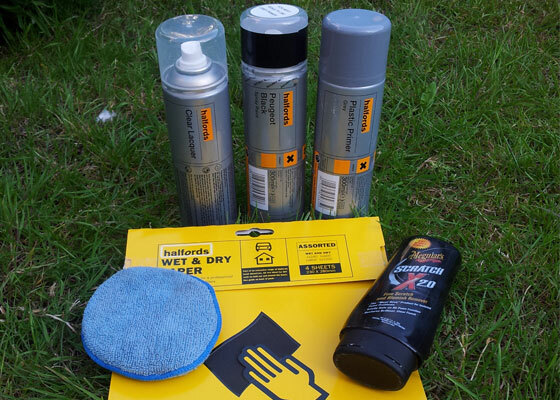 One tip if reusing aerosols is, when finished, to hold the can upside down and spray for about a second. This means the paint is not picked up and you are just spraying the propellant which cleans the tube and spray head. hi guys, is it totally necessary to sand the plastic down. i dont want smooth trims, as in i want to keep the texture. can i simple wash them, primer then paint and lacquer? I find four types of paint available: Synthetic, Polyurethane, Cellulose and 2 Pack. Which is better for plastic trim? Great, nice, good explained tutorial! If I would use some heat lamps should the paint dry faster? or would it be to hot and start cracking the paint? You should always paint in a dry, warm environment. Humidity is very bad. I don't know that much about heat lamps but they should help as long as you don't put them too close to avoid hot spots. How do you remove door trims side bump protectors to paint? Is it easy to remove them and fix back on. Was planning on masking off and painting! I can't remember 100% but I think the bump strips slide one way and then you can lift them off. You'll then need to remove the clips with pliers and fit them into the bump strips before you refit them (just push on). I think some people just pull them straight off, being careful to apply pressure evenly. You'll want to buy some replacement clips as I guarantee some of them will snap. People sell them on eBay or you can buy direct from Peugeot. Sounds interesting! Yes I would sand the black base coat before doing the glitter coat as otherwise you could get a poor finish. I imagine the glitter coat will be very very thin so you should get minimal issues with orange peel finish. Ifollowed this guide painting a motorbike fairing and its turning out great so far. Is there no need to finely sand down the laquer coat like all the others to get a better finish? Or would you only do this is it had a run in it? Glad to hear it's working well for you. You should be able to very lightly sand the clear coat with 2500 wet and dry and then polish it back up with T Cut or similar. I would probably give it a really good going over with a cutting compound before getting the sand paper back out though. Yes you'll need to sand down any bumpy parts of they will show through the paint and it will look naff. Whatever you paint onto must be silky smooth. Done mirrors, front lip and now doing part of front grill, your instructions are spot on. did not sand before applying lacquer as the paint job itself was soooo soooth. job was as smooth as a baby's bum. Thanks for the instructions, it's the best explained i could find. Hi Carlos, Glad you found the guide useful! You would probably have got a better finish if you had sanded before applying the lacquer as it would have been even smoother than it was. However, if you've done a really good job on the colour coats then you should get away with it. I notice someone earlier mentioned glitter paint. I have used the same, sanded the base coat first, glitter coated, then three coats of lacquer. So when that is dry should I using cutting compound or not? If I did is it likely to spoil and lift the glitter. First time I have done anything like this and been following this very useful guide to get me there, thanks! I'm painting the fuel for door my Tiburon, just got to the clear coat stage and the paint underneath looks like its cracking/beginning to flake immediately after applying. What did i do wrong and how do I fix it? Any tips on painting and laquer my airfilter lid, fuse box lid and battery cover under bonnet? All the original plastic isn't smooth.... and also can I remove the casing on side of engine that hides the belt to paint? You will need to flatten the plastic if it's not smooth or the bumps will show through the paint. One quick question: If I have to paint my car bumper, which already is painted, but with a lot of scratches all over around, and I wish to paint it all, do I need to use the primer ? Yes you will need to remove any scratches or they will show through.